Best governance structure for b-schools? Here is the headline from Financial Times editor Della Bradshaw: From the editor: Trouble at the top. “A spate of deans’ departures raises questions about the way they were appointed,” writes Bradshaw. The examples given in the article are the short tenures of Robin Buchanan at LBS, John Wells at IMD, and Frank Brown at Insead. The basic gist of the article is that these examples illustrate bad governance practices at non-university-based schools. What’s bad? Well, according to Ms. Bradshaw, too much faculty involvement in the Dean selection process. Of course, most US and UK university-based business schools follow a straight­forward system in which the president (US) or vice-chancellor (UK) appoints the dean of the business school based on recommendations from a search committee or firm. Presidents hire and only presidents can fire. It is hard to imagine any other organisation – commercial or academic – allowing the workers to effectively decide who will be their new boss. When the FT is next looking for an editor, will jobbing journalists be asked to vote? I’m not quite sure where to begin with this. But, let me try. First, Bradshaw cites no evidence that these short tenures were bad outcomes. Rather, they may be the kind of flexible, timely, and appropriate decisions that schools should make upon learning that the new Dean is a dud. Managing a research-based business school is a tricky endeavor. On the one hand, a Dean needs to have the management chops to run an organization constrained (yes, constrained) by insanely dense complementarities between policy variables. On the other hand, he or she also needs to understand the research world, both in order to construct a sensible educational vision as well as to manage faculty resources. The problem is that each of these skill sets typically takes a career to develop and, hence, are rarely co-occurrent in a single individual. Perhaps we should be surprised that the rate of Dean turnover isn’t higher. Second, it appears that Ms. Bradshaw has never heard of a governance form called the “partnership.” Traditionally, faculty have been run along the lines of a partnership, much the same as in law firms and consulting practices … and for most of the same reasons (aligning decision rights with inherently decentralized information and creating effective incentives). True, the partnership model for b-school governance has been greatly degraded in recent years. In its place, we now have the corporate-style administration. This modern administrative form — untethered from from faculty oversight — is, in the parlance of our times, a bug and not feature. Treating faculty as mere “workers” (or, worse, as a frustrating “problem” to be sidestepped whenever possible) results in misaligned decision rights and incentives, which then contribute to undesirable behaviors like: the mindless chasing of rankings put out by popular business periodicals; expanding capacity to what may be an unsustainable level; the dumbing down of graduate business education; and, a shocking rate of tuition inflation. This is why, whenever I hear university administrators refer to themselves as “The Senior Management Team” (typically, embedded within some self-congratulatory announcement), it really makes my skin crawl. By the way, in terms of her own experience, Ms. Bradshaw was an English teacher before joining the FT, where she has served as a journalist for the past 20 years. As far as I can ascertain, her experience includes neither scholarly research nor business unit management. She has been involved in the FT rankings since their inception in the 1990s. Think on that. Psyched Out Strategy: What is a firm? Glenn Hoetker recently gave me the opportunity to consider what new contributions the field of psychology could offer to the strategy literature (see the description here). The video illustrates how behavior often depends more on perception than on reality — does it matter if the steering wheel is attached or not if the other driver acts as if it is? Often, researchers are interested in organizational outcomes and theorize that the underlying behaviors are driven by objective reality. What research opportunities are highlighted as we take seriously the subjective nature of our most central constructs? 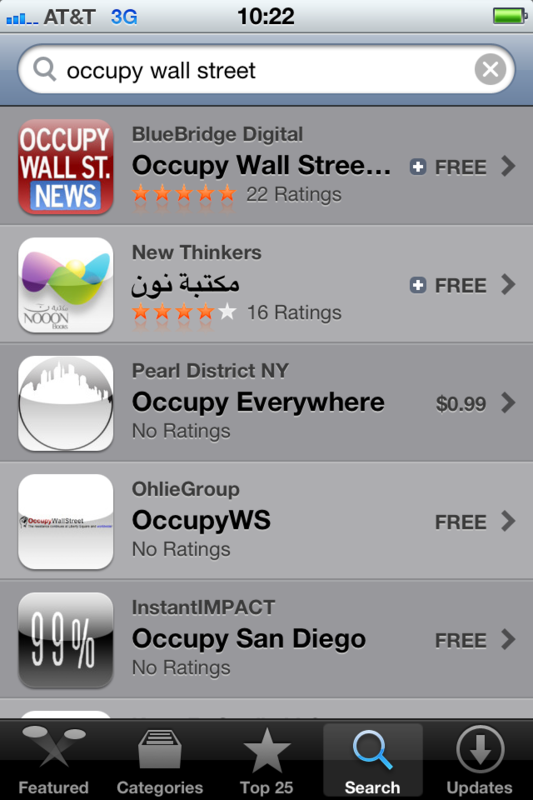 I just searched for Occupy Wall Street apps on my phone – and the result is below. I think there will possibly be novel organizational innovations that will emerge (structure of protests, communications, organizational forms etc), but these apps also have elements of novelty. BusinessWeek talks about a few of these apps, under the title million app march. 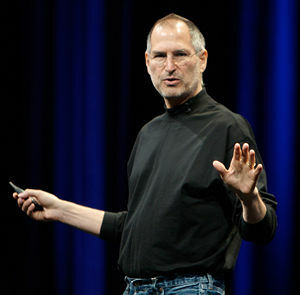 As a student, at Reed College, Steve Jobs came to believe that if he ate only fruits he would eliminate all mucus and not need to shower anymore. It didn’t work. He didn’t smell good. When he got a job at Atari, given his odor, he was swiftly moved into the night shift, where he would be less disruptive to the nostrils of his fellow colleagues. The job at Atari exposed him to the earliest generation of video games. It also exposed him to the world business and what it meant build up and run a company. Some years later, with Steve Wozniak, he founded Apple in Silicon Valley (of course in a garage) and quite quickly, although just in his late twenties, grew to be a management phenomenon, featuring in the legendary business book by Tom Peters and Bob Waterman “In Search of Excellence”.